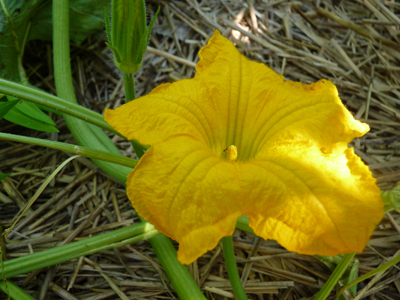 Last year, when asked what she’d like to grow in Mom’s garden, my youngest selected a “Gourd Collection” packet of seeds. I set aside the top-most garden bed, as the soil is the rockiest and least inviting. 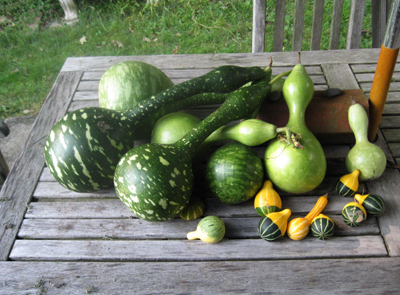 That sounds harsh, but gourds are for fun, and the garden was mostly for food. 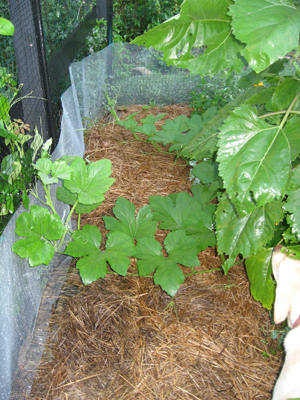 That bed also had the shorter trellis, and I reasoned that the gourd vines would be just right for it — accustomed as they were to spreading out only (I thought) over the ground. I’d offer them a shallow bed, and a modest stairway, and all would be well. My first clue that things would be not what I’d expected was my first glimpse of the seed packet. It was easily three times the size of the other packets. I learned that was because one of the seed types was half the length of my thumb. There were four distinct types of seeds, and we planted all four types. You, I’m sure, already know how this turned out: The vines went wild, growing up and over the trellis in about 25 minutes, and then onto the top of the 7′ high deer fencing, and on and on. But…they produced beautiful gourds. The largest seeds produced the largest gourds, of course! 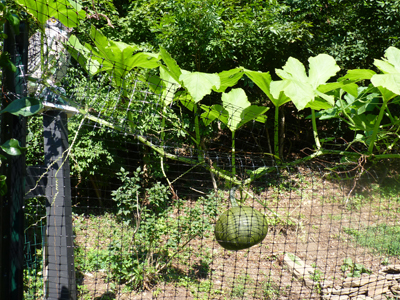 The largest gourds started to weigh down the deer netting. They were hanging in mid-air, getting heavier by the day, and I was afraid they’d tear the netting, or snap their vine and die prematurely puny. So I brought out lengths of cheesecloth, and made a sling for each gourd and hung each one on a fence post for support. Not a bad idea, but my youngest would have perished in humiliation. And the gourds were, after all, for her. So I declined with, I confess, regret (because it would have been funny). We harvested the gourds, I dried them inside, admiring their mottling, and enduring the kids’ horror: they’re mouldy! they’re festering! they smell! They were none of those things. Just a moment passed, I swear. I turned back, and there it was, up and over the fence! 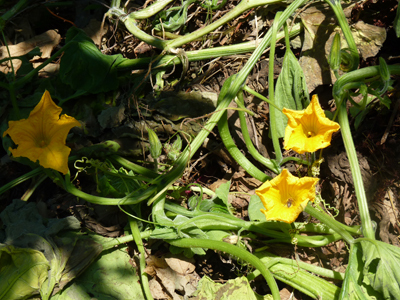 A vine even appeared on my compost heap! Rotting bio-mass never looked so good. And indeed, the blossoms are beautiful. A color as strong and insistent as the fruit-to-come. And so, once again, I am impressed by those that volunteer. For their selfless service, and unflagging energy. Whether they are calling my phone, ringing my doorbell, or climbing up over my fence, I salute them. And I appreciate having a surprise second-harvest. That was a lovely bonus. “The world is hugged by the faithful arms of volunteers.